See the village through eyes old and new. 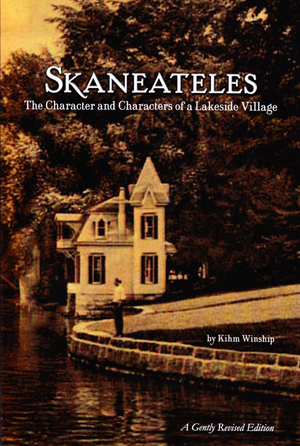 Nestled herein you will find stories of Skaneateles, its waters and shores, sons and daughters, heroes and villains, dusty wayfarers and spotless summer society. Among the more than 100 true tales: an adventurer vanishes on a quest for gold and ivory, a Dickensian cemetery owner moves bodies by night, a sailor composes a Skaneateles Polonaise and a boater fishes with Satan, a plucky lad skates the frozen lake end to end, and glasses are raised to a Prussian baron, a Confederate raider, a Prohibition rum-runner and a Medal of Honor winner. The Sherwood Inn hosts a world chess champion and a boa constrictor. Stars of the silent screen upstage a Governor at the Krebs. A Skaneateles swim lesson is recalled as the Lusitania sinks in the Irish Sea. Men with shaky hands test the first atom bomb and save the Oreo. Also, many travelers’ accounts and impressions grace the page for the first time in more than 100 years. Welcome to Skaneateles, a village of character and characters. 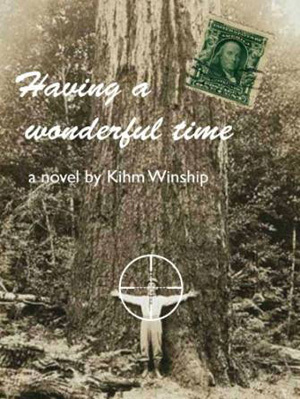 Now in its fourth printing, available at Amazon. Skaneateles and St. James’ recalls a cold welcome for the son of Benedict Arnold, a visit by Washington Irving, the women’s circle hosting at Fuller’s Tavern, “When Rectors Attack,” a Civil War hotbed of sedition, “The Troubled Pew of Ellen Dodge,” “The Baby Plague of 1916,” “The Priest with a Purple Heart,” “The Bookworm,” “The Bug” and more. This volume also includes early histories of St. James’, never before published in book form, as well as a parishioner’s memoir that has been out of print for more than a century, with notes for the contemporary reader. 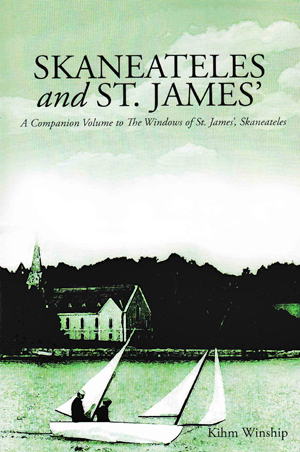 In the companion book, The Windows of St. James’, Skaneateles, you will find full-color photography of the church’s historic Tiffany and Henry Sharp windows and the stories of those they memorialize. Now on sale at Amazon. The Windows of St. James’, Skaneateles shares the stories of the church’s historic stained glass windows and those they memorialize, among them: a New York yachtsman who became a Major in the Confederate Army, a Roosevelt who was caught on the Mississippi during the New Madrid Earthquake, a sea captain who crossed the Atlantic 99 times, an artist who roughed it in Chile and painted in the Sahara, and a donor who insisted his windows include the faces of his wife and mother-in-law. Illustrated throughout with full-color photography of the Tiffany and Henry Sharp windows. 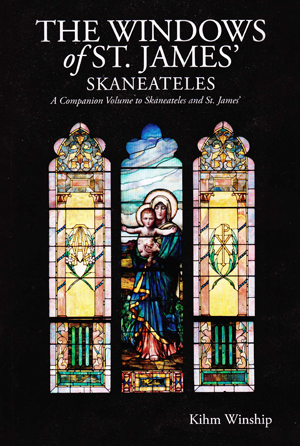 The companion book, Skaneateles & St. James’, shares 100 more stories of this historic church and its people around the world. 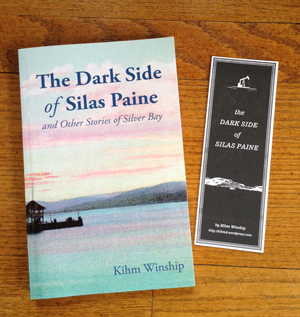 Thrill to untold stories of Silver Bay on New York’s Lake George, one of the most beautiful, and interesting, places on earth. Enjoy Silas Paine’s sudden vacation, Edwin See vs. Gentleman Jim Corbett, Martin Niemoller vs. Hitler, The Hindenburg flyover, Chinese pirates & robber barons, a saucy vamp & vampire bats, the flying ax of Dan Beard, the Alfred Stieglitz mystery, the true origin of “Follow the Gleam” …. and much, much more. 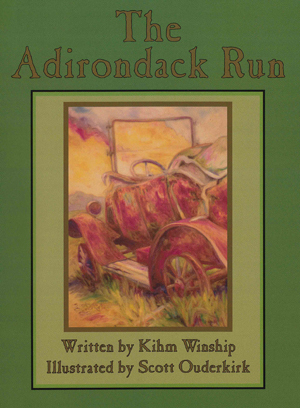 All fun, all true, all Adirondack history. Available at Amazon and, on occasion, at Silver Bay. At last, a children’s story about bootlegging. If you love the Adirondacks and have trouble with authority figures, this graphic novel with art by Scott Ouderkirk is for you. It also helps to like old cars, clear winter nights and people who trust you without asking a lot of questions. There’s some true love in here, too. For whatever reason you open the pages, Scott and I hope you enjoy the ride.